The fun just doesnt stop at Sooner Bounce. 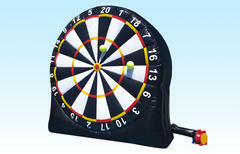 We have the ultimate inflatable dart board for your next event. We have archery and Soccer at this time, more games to follow in the coming months. Test your skillz on this giant inflatable dart board to see who can get the highest score. But wait, theres more!! This is 2 sided for multiple players at once, make it a tournament!